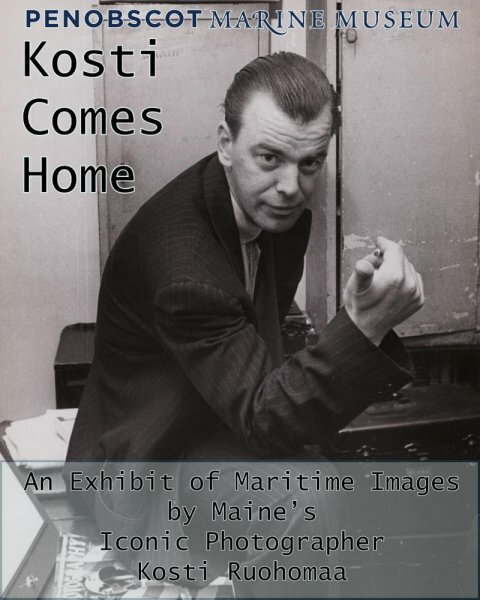 The first exhibit of Kosti Ruohomaa’s photographs since his archive arrived back in Maine last year is set to open on April 1, 2018 at the Camden Free Library. April is Maritime Month and Penobscot Marine Museum will once again partner with the Camden Free Library and create an exhibit for the Picker Room. This exhibit is much anticipated as Ruohomaa's work has been locked away in a warehouse in New Jersey for the past 50 years. His photo agency, Black Star, donated his archive of negatives, prints and contact sheets to PMM in the fall. The exhibit will focus on his Maine coastal and maritime work. On April 3rd at 7 p.m. there will be an opening reception at the library for the exhibit and an illustrated talk by Kosti's biographer, Deanna Bonner-Gantor. The exhibit will be on display in the library through the month of April, and will then return to PMM where it will be on display this summer.